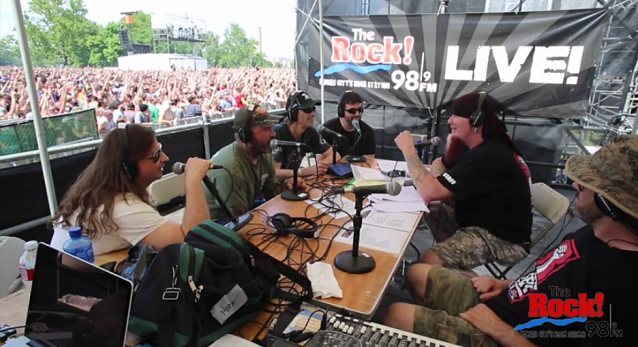 Moose of the 98.9 The Rock radio station conducted an interview with Massachusetts rockers STAIND earlier today (Saturday, May 31) at Rockfest at Liberty Memorial in Kansas City. You can now watch the chat below. STAIND singer Aaron Lewis will stage the fourth annual "Aaron Lewis & Friends" benefit concert to raise money for his foundation, It Takes A Community, which is dedicated to serving the educational needs of the children in his area. According to The Pulse Of Radio, this year's show will feature a rare acoustic performance from STAIND itself, along with an unplugged appearance from Brent Smith and Zach Myers of SHINEDOWN. Although STAIND just played at Rock On The Range in Ohio and has a few other dates on its summer schedule, the band does not have any plans at the moment to begin working on the follow-up to its 2011 self-titled album. Lewis told The Pulse Of Radio a while back that the members of STAIND don't really see each other when they're not working. "We're business partners and we always have been," he said. "We're not friends that have known each other forever. We've known each other to start this band and, you know, when we go home from being on tour, I don't talk to anybody and they don't talk to me until it's time to do something and there's a need to talk to each other. It's a business; it always has been a business." Guitarist Mike Mushok told the Midland Daily News about the band's future, "It's got to be something that Aaron wants to do. I always enjoy writing with (Aaron) and I look forward to it. We complement each other. He makes what I do better. Hopefully, I give him something that he wants to sing over." Lewis has pursued a solo country career for several years, while Mushok has composed music for ESPN and some documentaries while also touring in NEWSTED, the band recently launched by ex-METALLICA bassist Jason Newsted.